Best of all, these social media campaigns are easy to run and easy to track! In fact, the hardest part is just figuring out what you want to run. To help inspire you, we’ve compiled some great examples of giveaways on Facebook. Get your ideas here and then check out this post on how to do a giveaway on Facebook. About the business: Mario Badescu Skin Care is an online retailer of skincare products. They’ve grown to 92,000 Facebook likes since they joined the platform in June 2009. About the giveaway: They offered a 10% discount on skin care for a year to everyone who entered their contest (not to mention a chance to win free skin care for that year). • Comprehensive Process – The 4 steps it takes to enter for a chance to win are simple and easy to understand as well as broken out from the rest of the copy. Requiring participants to send a private message allows the company to know which new “likers” are actual participants in the giveaway. • Perceived Value – The prize Mario Badescu Skin Care offers (a free year of skin care products, personalized for their needs) is perceived as a great value in exchange for a Facebook like and share. • Incentives – Anyone who shares their image is offered a 10% discount code, so everyone “wins” a little something. • Relevant Coupon Code – Their code “SHARE” is directly related to the objective of this giveaway, which is to grow their following. • Simplify the Messaging – At first glance, the presentation seems text-heavy and crowded. Minimizing the copy, including an image, and creating more “open space” will make for a more attractive post. • Hide the Coupon Code – By including the coupon code within the steps, the company is making it easy for anyone to enjoy the coupon, whether or not they actually “liked” their page or “shared” the post. To encourage more likes and shares, they should only give the coupon code to those who have completed the first 3 steps. Make ‘em work for it . . . at least a little! • Include a link to their site or to a landing page to make it easy to redeem the offer. Rignite is a software solution that makes it easy to run and track giveaway and contest campaigns on social media. 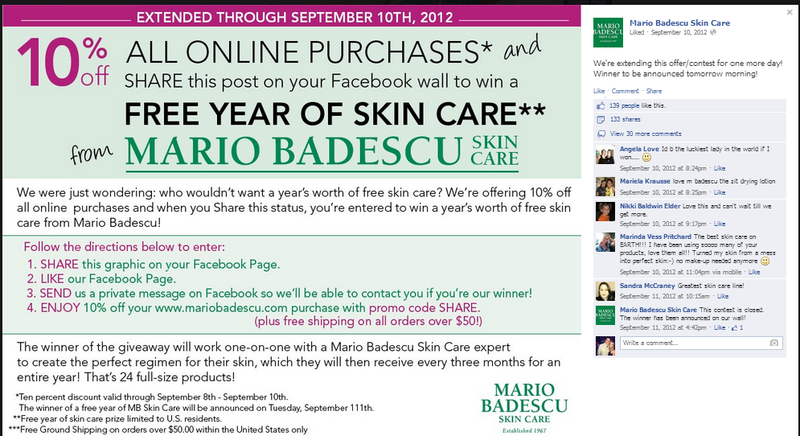 About the business: We’ve already talked about the business above, so let’s just take a moment to note that Mario Badescu Skin Care is quite good at running Facebook promotions. 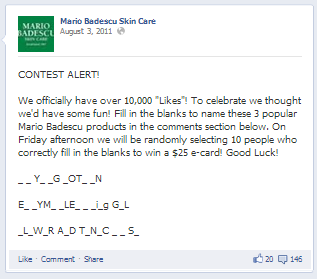 About the giveaway: Fans of their Facebook page were asked to fill in the blanks of some of their popular products. After a few days, 10 random winners were chosen to receive a $25 gift card. • Concept & Simplicity – The contest encourages engagement and participation by asking participants to “fill-in-the-blank” of some of their skincare products directly in the comment box. • Multiple Winners – Selecting 10 random winners instead of just one increases the odds that a participant will be selected (and encourages additional entries, even when there’s already a plethora of entries). • Easy to set up and run – This campaign takes less than 5 minutes to set up. They didn’t need to create an image (although it would be a nice touch) or communicate complicated entry steps, because they kept the campaign dead simple. • Creativity – To encourage participation and excitement, the company could have included an image, more color, and a creative font. • Optimize Posting Time – For optimal engagement, Mario Badescu could have scheduled their posts at the best time to post on Facebook for their audience. About the business: Homage is an online retailer of t-shirts and sportwear. They’ve got this Facebook “thing” figured out as you can tell from their following over 141,000 fans. • Simplicity – The entry instructions are easy to understand and execute. The announcement was made directly to each winner as a response to their comment. • Theme – Located in Columbus, Oh, Homage struck a chord with a majority of their following by basing their giveaway around the Buckeyes. • Timing – The timing of this giveaway was appropriately at the beginning of the college football season. 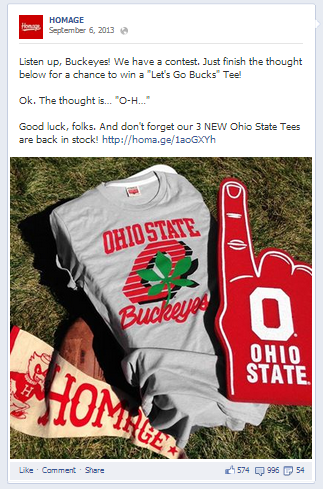 As a bonus, they were able to tie in the promotion of their new Ohio State tees. • Website Link – Including a link to their website encourages people to browse their product and may boost sales. • Create a series – Homage could run a collegiate series campaign on Facebook, running a giveaway like this for all 30 of the teams they carry. That way, they can further boost engagement by appealing to ALL of their fans. • Officially announce the winner – In addition to directly responding to each winner’s comment, Homage could have posted a “winner response” to boost further engagement as well as to inform everyone and announce the winner’s selections. Whether your goal is to boost engagement, grow your following, or build an email list Facebook giveaways are an easy and popular path to success. The only limit on what to give away (and how to give it away) is your imagination. Tell us: What awesome Facebook Giveaways do you have brewing? What will you giveaway and what will you require for entry? Kim. This looks good. Do you have examples of what some of the landing pages look like? Also what some of the reporting/results look like on your dashboard. I am assuming that the user creates their own subscription form to embed on the landing page to gather emails? Do you have templates that can be used for the landing pages? I’ve attached two images from Rignite’s Campaign reports. The one labeled “Number of Entries” is an example of a campaign where the call-to-action is to comment on a post for entry into the giveaway. The one labeled “Campaign Reach” is compiling all social reactions to all posts that are a part of that campaign. For example, if you schedule a series of Tweets to promote your Facebook giveaway, we’ll aggregate all the reactions to any posts in your campaign, into one campaign-level report. Rignite does not have a landing page creation tool. We have an option to include a link to a landing page for your campaign, and we’ll track the total clicks to that page from your campaign posts. But the creation of the landing page is something that you’d do either using your website content management system, or a landing page tool. I hope that answers your questions! Do you have a specific campaign you are planning to run? Thank you Kim. They both look good. I’m part of an artist group who is exploring ways to market art. I’ve also been following a friends’ progress who just set up a campaign for her business through a different provider. The results were good, but based on her experience in setting it up, I thought it best to look for another provider. Do your “like” gates work with mobile? How do you pick the winner? Do you provide a list? No problem Dianica! We don’t use like gates. The campaigns are run straight on your timeline, so there is no need for a complicated app set up. Yes, we provide you with a list of people who took the action you required for entry. So, if you set the requirement to be a comment on the post, you’ll see a list of people who commented. If you set the requirement to be a “like” of a post, you’ll see a list of people who liked the post. You can set the campaign to have 1 or more winners, which you can either have randomly selected from the list in the case of a random sweepstakes. Or you can manually select the winners from the list in the case of a juried contest. Sounds good. I’ll ask my friend to be in touch as well. Her campaign went well, but the set up was a nightmare. The software didn’t work like they said it would. She’ been on with support about a dozen times, chat, and 2 hr skype to get the “easy so anyone solution” to run. After all the time wasted, for most of it, it turns out just doesn’t work on mobile, templates are not editable, and custom templates are not responsive. This is her first month. I’ll ask her to come by. She wants to run these campaigns regularly, just not the nightmare set up. I did a t-shirt giveaway that was going to pick a winner today, but no one was following the steps to win. Don’t get that at all! Any tips on how to improve this post for better engagement. I like the general idea of your campaign a lot. Perhaps the required steps just took too much effort for your followers. It sounds like they’d need to go to your website, download a photo of something, and then go back to FB to post it in the comments. And then…they’d have to go rally their friends to vote on their comment by liking it. It could just be a bit too many steps that makes people feel like they are having to go too far out of the way to get their entry in. Here are a few ideas to simplify it. Then, you might want to consider removing the final line that says to Share and Like your page. It’s just more CTAs that can add confusion to what you are trying to get people to do, which is enter your giveaway. Hi Kim, My daughter is a Music producer / artist and we are trying to build her Facebook page with a T-Shirt giveaway which has her picture on it. We posted a pic of myself wearing the shirt and we received several people asking for one as well. I’m just not sure on how to use these shirts to build her likes and engage people. I appreciate any advice.